"I could listen to John Harle play almost anything for hours". "Mr Harle has become an eminent modern musician. He's a dazzling player, with an immense range of tones, and a magnetic musician". John Harle adapts to any musical style that comes his way. He plays with originality, intelligence and fire". "Hearing Harle, you can understand why composers are surprised and delighted by his artistry. His keenly imaginative playing directly echoes the inflections of the human voice, and his fine control of tone eliminates the sloppy wailing of some saxophonists that is such a pain". Equally at home in all genres as composer and player, he is one o the most accomplished of that new generation of musicians that has successfully breached music's artificial and still too strictly observed boundaries". 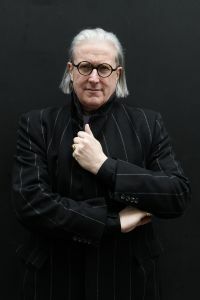 Born in 1956, British saxophonist John Harle attended the Royal College of Music, London, making history by graduating with a final mark of 100%. In 1984 he won the AMCON Award of the Concert Artists Guild of New York, and over the ensuing years developed a unique, broad saxophone sound based on the physical resonances used in singing. He famously premiered Harrison Birtwistle’s controversial ‘Panic’ at the Last Night of the BBC Proms in 1995, and with this, and other works written for him including concertos by John Tavener, Gavin Bryars, Richard Rodney Bennett, Michael Nyman, Sally Beamish, Michael Torke, Stanley Myers and Mark Anthony Turnage, he has performed with countless international orchestras and has sold over 500,000 CD’s on major labels. Harle is a prolific composer, having written two operas, three saxophone concertos and many symphonic and chamber works, as well as over 200 film and tv scores. His theme to BBC 1′s Silent Witness has been the main theme of the series for fifteen years, and won ‘Best Music for Television’ at the RTS Awards in 1996. John has just been nominated for the RTS ‘Best Original Musical Score’ 2012 for his music for BBC2′s ‘Lucian Freud – A Painted Life’. His collaborations with other artists extend to areas outside classical music, and include Elvis Costello, who sang on Harle’s seminal album ‘Terror and Magnificence’, Herbie Hancock, Moondog and Sir Paul McCartney, for whom Harle was Creative Consultant for six years. His recent production ‘Morricone Paradiso’ (EMI Classics) reached the Number 1 chart position in Japan (in all genres) for four weeks last Autumn. Forthcoming album projects include ART MUSIC – music inspired by painting (Sospiro Records) and THE TYBURN TREE - Songs from London's Dark Side with Marc Almond (Sospiro Records). He is Artistic Director and Producer of Sospiro, and is Professor of Saxophone at the Guildhall School in London.